Around 140,000 homes were left without power after 100mph winds were recorded across the country. Engineers are working to restore power to more than 20,000 homes after Scotland was battered by winds of more than 100mph. Gusts of 102mph were recorded at Blackford Hill in Edinburgh on Tuesday morning, while speeds of 97mph and 91mph were noted in Islay and Bishopton, Renfrewshire. The country's main road and rail bridges were closed for a time, dozens of flights were cancelled and train and ferry services had to be suspended. At the peak of the storm, tens of thousands of households were left without electricity and members of the public were warned against travelling if their journey was not essential. Several trees were brought down and blocked the line near Markinch Railway Station in Fife. Network Rail said it expected to have the line cleared by around 3pm. On Wednesday morning, ScotRail said trains between Glasgow Central and Gourock/Wemyss Bay will not operate in both directions until at least 4pm. A replacement bus service is in operation. Services between Dalmuir and Larkhall will not run on Wednesday, as will those between Alloa and Stirling, while the Glasgow Central to Largs/Adrossan service is expected to experience cancellations and delays. Helensburgh to Edinburgh trains will start and terminate at Shettleston until around 9am, while parts of the Milngavie to Motherwell route will not call at several stations in South Lanarkshire. 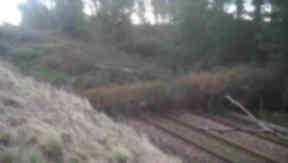 Damage at Crossmyloof station has also caused problems to services which travel through it. By Tuesday night, the ten-lane Kingston Bridge in the heart of Glasgow, the Erskine Bridge, the Tay Road Bridge and the Forth Road Bridge had all reopened after being forced to close. At the peak of the storm, Scottish Power had 100,000 without electricity, while Scottish Hydro had 40,000. By Wednesday afternoon, Scottish Power had 15,000 without power in the Ayrshire, Lanarkshire, Fife and central Scotland areas, while Scottish Hyrdro was still trying to reconnect around 9000 customers in the north of Scotland and the Western Isles. Both companies said they had drafted in hundreds of extra engineers to repair the network, who had worked until late on Tuesday before resuming at first light on Wednesday. Ferry company Caledonian MacBrayne experienced disruption and delays to several services on Wednesday after the severe weather, with sailings to Arran, the Isle of Bute and Cumbrae among those affected. The Scottish Government said First Minister Alex Salmond chaired a second meeting of its resilience committee on Tuesday afternoon to address the impact of the weather, which the Met Office had placed a red alert warning for.